The moment the death of a celebrity or a notable person is announced, the news media bombards us with highlights, accomplishments, failures and sometimes the most miniscule and ridiculous facts and figures of their life and work. So, today and for the last week, the passing of Steve Jobs is everywhere. Accolades, well deserved, are flooding the airways. An icon has left us. The void will be large. Steve Jobs revolutionized personal computers, animated movies, music, phones, tablet computing, digital publishing and their marketing. The quirky news items also abound. One headline announcing his death says: “Steve Jobs: Arab-American, Buddhist, Psychedelic Drug User, and Capitalist World-Changer.” Having been adopted, he’s become the poster child for adoption and against abortion with some asking what would the world be like if Jobs had been aborted? An Indian adoption agency is launching a new campaign with a similar message. Westboro Baptist Church, known for picketing the funerals of soldiers killed in one of our wars, plans to demonstrate at Job’s funeral. Jobs, they believe is the devil, evil, because he’s taking credit for the iphone when we all know that only god creates things; ironically their leader used an iphone to announce the groups plans and the schedule. I hardly knew who Steve Jobs was until he died. I have vague recollections of a very thin man in jeans and a black turtleneck, standing on a stage, eclipsed by a large screen, displaying something new and exciting. I also recall my friend, Julie, telling me of her exasperation when her physician husband turned into a fourteen year old boy, standing in line at the mall to be one of the first to have an iPad. I don’t own any of Steve Jobs famous inventions. I don’t tweet or text, do facebook or have a camera on my simple little tracfone, don’t know what apps are for and can’t be convinced that I’m missing anything. I did a google to find out what the “i” in iphone means. Interesting that there is no definitive answer, but lots of conjecture. Here are the guesses: it means “I” as in me, industrial, internet, identity, intelligent, intel, information, interactive. If this keeps up, soon we’ll have used every “I” word in the dictionary. The most credible answer is that this never was an official Apple connection but a marketing ploy tacked onto the original iMac because it was supposed to be operational right out of the box, therefore instant. With his death, the facts about his private life, which he carefully guarded, tell a compelling story far beyond his work. Steve Jobs was a mixed race child born of a Syrian father and a Swiss-American mother while they were graduate students at a Wisconsin university. His biological father had attempted recent contact with no success but Jobs had a relationship with this half sister, author Mona Simpson. He was adopted at birth, by all accounts, to a functioning family with the father, a machinist, who put in lots of tinkering, garage time with the young boy. His biological parents had insisted he be adopted by college graduates, a plan that went awry when the chosen couple, at the last minute, decided they wanted a girl. Jobs, not a college graduate himself, spent a little more than a semester “dropping in” on classes that caught his attention at Reed College in Oregon. The one he found most helpful was calligraphy. He dropped out of college because he didn’t think his parents should spend so much money on something he found useless. Jobs has four children from two relationships and was reportedly a devoted father and husband. He lived for some time in an ashram in India. The adoption story is getting a lot of attention. Nancy Verrier, author, psychotherapist and mother of an adopted child and a biological child wrote The Primal Wound. In it she states that no matter what caused relinquishment, the child always feels abandoned. Being left by your parent, no matter when, is traumatic. In the continuing nature/nurture discussion, the latest hot theory is usually replaced next year with a new one. Who really knows how a child is affected. In this case, things seemed to have turned out just fine. When thinking about the attachment issues so common in adopted and foster children, perhaps this explains Job’s well known discipline and drive, his perfectionism, need to control all aspects of his work and his life. And maybe not. Steve Jobs conquered the world. At least the electronic, technology part of the world that leaves most of us mystified. And he did it his way. With all his organizational and visionary skills that contributed to his highly productive and successful life, he still fell to a force greater than he. But with his biography, he leaves a legacy to his children and to the world. In his own words. Most people will remember Steve Jobs through his ipod, iphone, ipad and all the rest. He will also be remembered as the tough, dismissive and demanding boss he was. I choose to remember him in how he conducted his life, how he lived what he preached and how he tied it all up in a neat little package in the end. 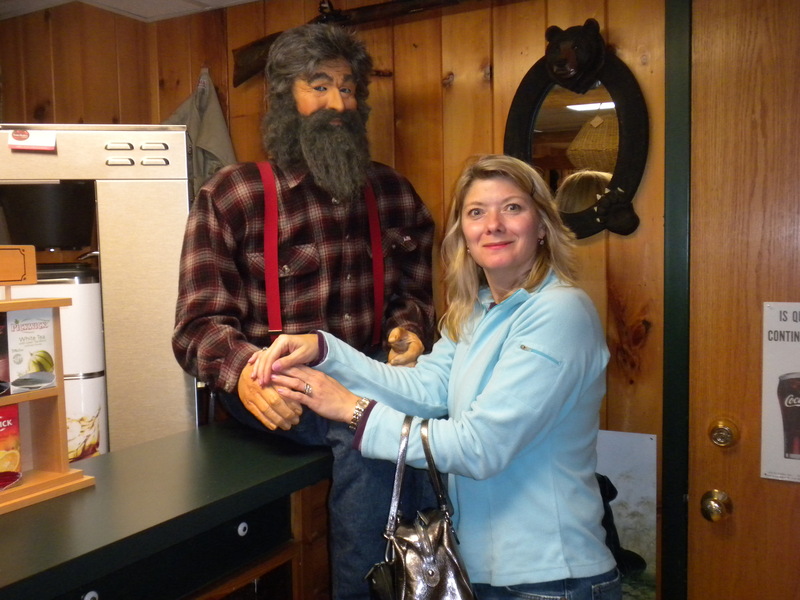 May 2011, I got the chance to introduce the northwoods to a couple of special girlfriends. I wanted them to see the things I love, the quiet of a peaceful lake, the comfort of small town friendliness and the quirkiness as well. Quirkiness is everywhere but in a rural, small town setting, it’s sometimes easier to spot. I often just appears when its least expected. I’d rented a lake front cottage at the Eagle Waters Resort in Eagle River for a Friday and Saturday night. Carolyn and Julie arrived on Friday about 3:00 pm. 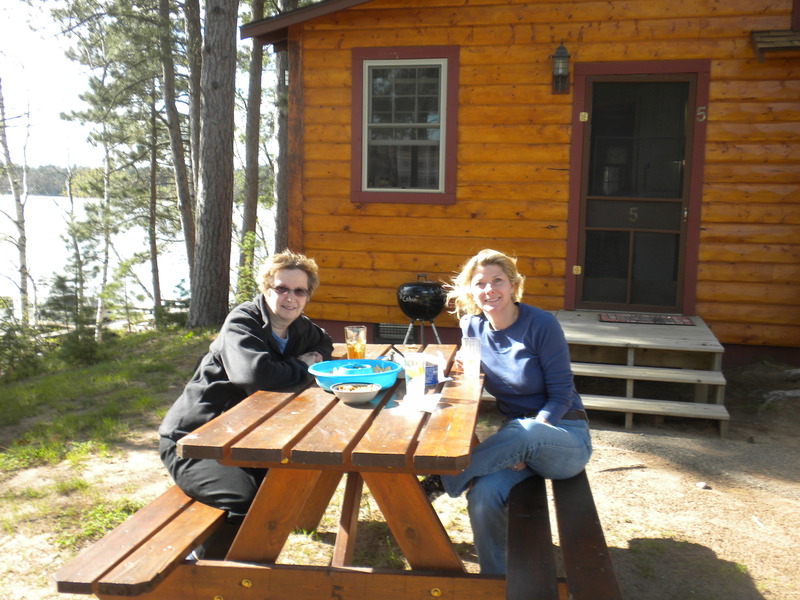 We raced to Trig’s to stock up on the much needed drinks and snacks; then we settled in at our two bedroom lakeside cottage, complete with fireplace. Carolyn looked relieved since friends had warned her that sometimes what is called a “resort” turns out to be something other than what had been advertised. Our nicely decorated and homey cottage met her standards. After enjoying the lake view, fresh air and a few toasts to our reunion, we walked down to the lake and out onto the pier, flirted with fishermen cleaning their catch of the day and took pictures on the shore. At dusk, Julie maintained a killer blaze in the fire pit. Girl Scout badges, no doubt, will be awarded. By the time we realized we were hungry, we’d had too much to drink to allow any driving. So much for a classy dinner I’d planned at the RiverStone in Eagle River. From our lake front cottage, we walked up the small hill to the resort’s lounge and restaurant. There, as the hostess seated us, she pleaded for our patience. Seems our waitress was just finishing a short set with the band performing in the lounge. “She’s only doing two songs,” the hostess said. Julie got us drinks to tide us over until the singing waitress, somewhat worn and wrinkled with her hair in an old fashioned bun, finished and bowed to her audience. A local celebrity no doubt, we guessed her to be in her seventies and were, at first, impressed with her high energy level. Once arriving at our table, she spent an inordinate amount of time telling us about her exploits and accomplishments. For her, our hunger seemed somewhat incidental. Finally we ordered. Along with my entree, I’d ordered sweet potato fries. The singing waitress was adamant; you never use catsup with sweet potato fries. Maple syrup is required. Throughout our meal, the singing waitress checked in several times to see what else we needed to know about her. I’m also certain she was checking to see if the catsup bottle had moved. Finishing dinner and getting ready to leave, we worried that our new best friend, the singing waitress, was going to follow us back to our cabin. She had so much more she needed to share. Finally, we got away and went home to continue catching up. 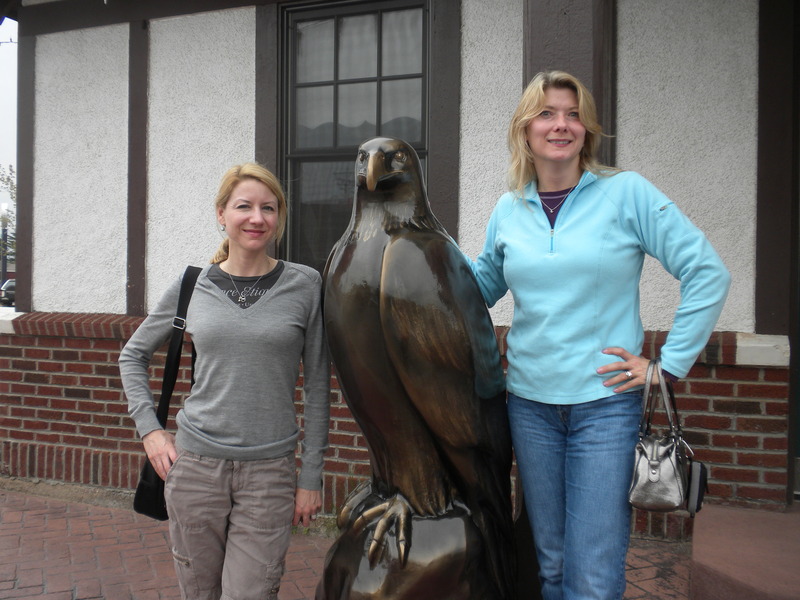 Saturday morning, we went into Eagle River and stopped at my favorite coffee shop, Sweet Beans, for breakfast. Then we proceeded to Boulder Junction; the main street is two blocks long, lined with gift, sports, art and jewelry shops, bars and restaurants. A typical northwoods tourist town. We meandered up the street stopping at several stores and generally acting silly. 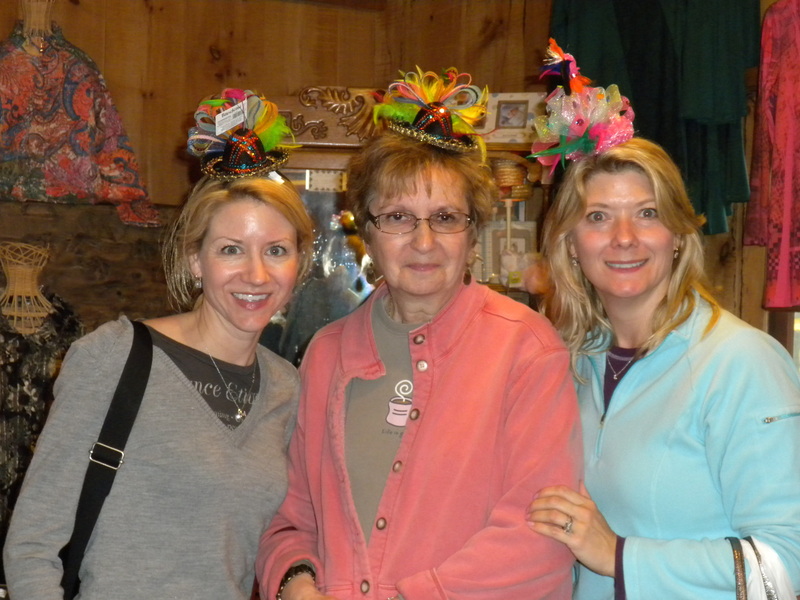 We tried on some funny looking hats and I’m sure the clerk thought we were nuts when we asked her to take our picture. But she accommodated us nicely. There’s that nothwoods friendliness for you. A half hour into our shopping, it began to pour, so we sequestered in a pottery shop. The longer there, the more we bought. I’m sure we made the artist’s day. Julie ran up the street to move my Blazer close to the store so we wouldn’t get drenched. She was appalled to hear that I’d left it unlocked and the keys on the console. This is Boulder Junction, I said. The potter agreed. Once the rain let up, we finished our tour by stopping for ice cream, then headed back to our home base. 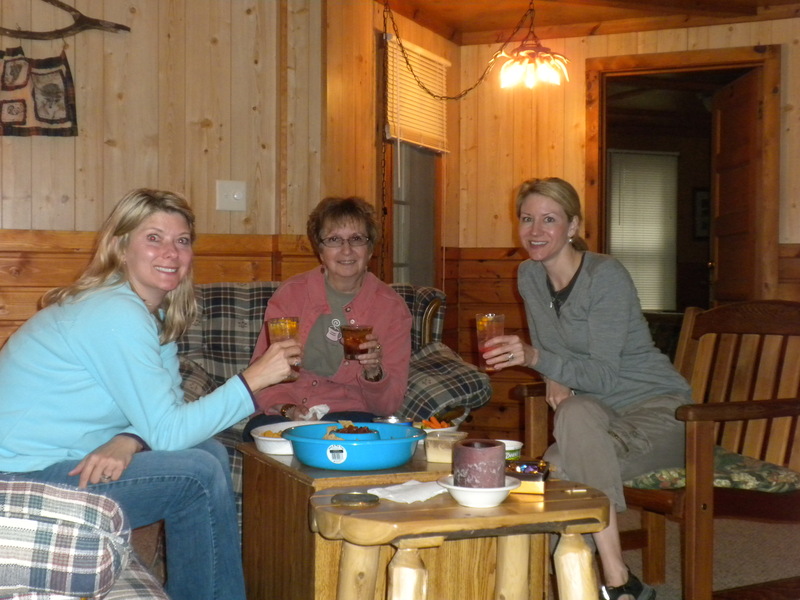 Back at the cabin, with more drinks and snacks, the constant chatter continued. We caught up on the trials and tribulations of step-parenting, the challenges of completing a PhD, adjusting to life as a single woman and the condition of the world in general and our lives in particular. Again, by the time we were hungry we’d had too much to drink for any driving. So, back to the resort restaurant. And the singing waitress descended upon us once again. When Julie and I had finished ordering, she turned to Carolyn and said rather harshly: “So, I guess you want a corn dog!” What’s up with her? I’d again ordered sweet potato fries and asked for catsup which the singing waitress didn’t bring. So, we borrowed from a near-by table. While on one of her interminable rounds, the singing waitress glared at our table, spotted the stolen catsup bottle and asked in a harsh voice: ”where did you get that?” Then she grabbed the bottle and stomped away. We were long finished and waiting for our bill when the singing waitress swooped by and without a word, plunked the bill down on the table. She stalked away and we never saw her again. After begging another wait staff to take our money, we naughty little brats escaped the guilt trip adventure into the land of the spiteful mother with our psyches intact. Once back at the cabin, we joked that the door had to be double locked to keep the axe murderer singing waitress out. Sunday, we returned to my favorite coffee shop for breakfast and said our goodbyes. How could the time have gone so fast and how could we not run out of things to talk about? We could barely get a word in edgewise, picking up where we’d left off the last time as if only a day had passed. If the severity of the sore throats and the hoarse voices experienced is any measure, we had a great time. 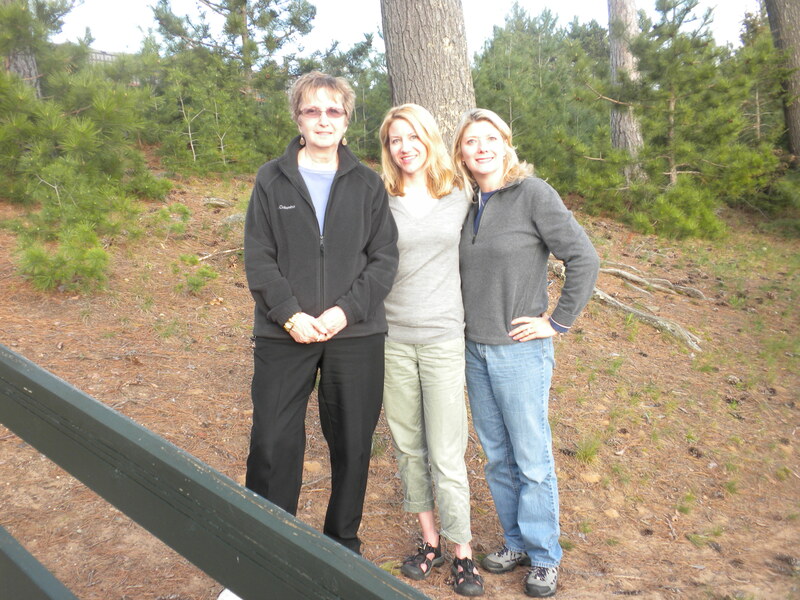 I was also happy that I could show these special friends the beauty and simplicity of the northwoods. The singing waitress’s quirkiness was an extra bonus the resort added to our event and I think she’d be pleased to know her fame has been established beyond her imagination. My parents could have been/should have been in the movie “When Harry Met Sally.” It’s a classic tale about relationships. Periodically, throughout the movie, a different couple appears on the screen, talking about how they met and how their life has been. Most of them have been married a long time and they clearly adore each other. To my mind, these brief segues are a high point of the movie. My parents, Corky and Bea, have a similar story. Since my adolescence and up to the present time I’ve watched my parent’s relationship with interest. Perhaps that’s something most kids do. It’s our first glimpse of how relationships function and it gives us some ideas about how we want ours to be. My parent’s marriage was complex. They seemed to argue a lot. My father often joked that he and Mom were “The Bickerson’s” which was an old radio program with constantly arguing main characters. Wanting to better understand the dynamics of their marriage, I asked them lots of questions about how they met and originally got together. I was just curious. What was the glue that made them stick together when many times that seemed so hard? It turned out to be an intriguing story, one that helped me realize just how haphazardly their relationship had been originally formed; it helped me empathize with their struggles. In the fall of 1942, Corky had left Ortonville, MN, joined the Navy and was attending a sub chaser training program in Miami preparing for his next assignment on a ship in the Pacific. 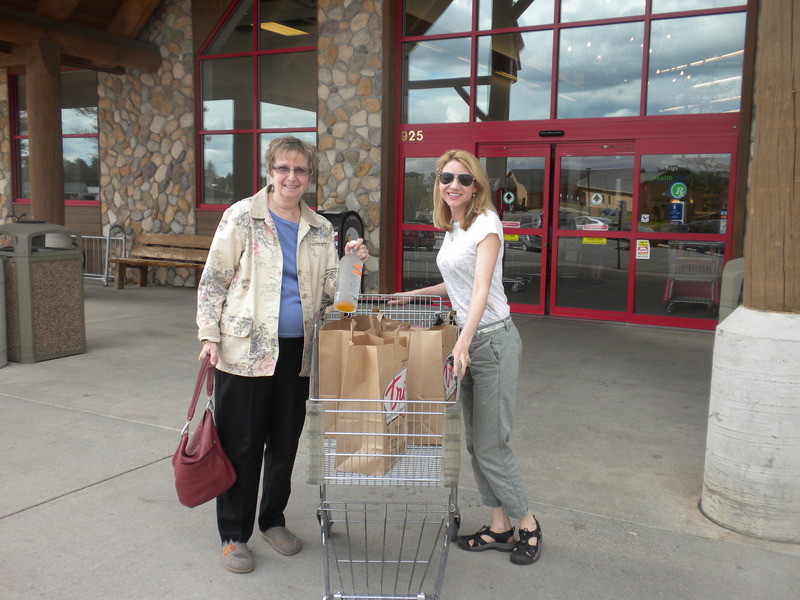 Bea had left Oshkosh, WI, was living in Miami with a girl friend and working as a store clerk. Bea seemed a bit of a rebel since during that time period, young, single girls seldom left their family to live on their own. A couple of times a week, Bea and her girlfriend went to the Miami Servicemen’s Center, a USO-type club. It was a way to interact socially, meet new people in a safe environment and also give the soldiers company. They felt it was their patriotic duty. At the Center, they’d sit at a table until a service man approached, asking to dance. Since there were always more men than women at the club, Bea and her girl friend were always busy. It was accepted social etiquette that when a young man wanted to dance with a woman who was already occupied, he could cut in. Then he could charm the young lady until someone cut in on him. The rule was that the man who was cut in on could not cut back until a third person had cut in. Each week, Corky came around to ask Bea to dance. He was, by his own account, truly smitten. Dad went on and on. It was one of those rare occasions when he verbalized his feelings. I remember thinking: wow, he really does love her after all. They began dating and, one of Corky’s friends started dating Bea’s roommate. Time was drawing near for Corky to report for his new assignment and he didn’t want her to get away, so he proposed. They were married six weeks after they had met and about two weeks later Corky left, reported to his ship and was off to the Pacific. Bea went back to Oshkosh. Even though she was brazen enough to live on her own as a single woman, she explained that a married woman lived either with her husband or her family. I also know Bea went to see Corky while he was on leave in in California. On that leave, I came into the picture. Bea went back home, had her baby (me) and waited for Corky to return home. From family pictures, I can see he came home when I was about six months old. I also see that this six month old baby was wondering who the heck was this intruder. It was a surprise to hear this story. But then, some of their difficulties seemed to make sense. These two young people who hardly knew each other, got married and never had the time to be a married couple (except for the two weeks in Miami) before they were parents. I often wonder if they would have gotten married had they met under different circumstances, had a regular courtship and met each other’s families. All that usual stuff. Would they have stayed together if they’d been married in another era? These days’ people get divorced more easily, perhaps too easily. It’s only in the last few years of their marriage, Bea and Corky seem to have come to terms with one another’s differences. About time, since they just had their 61st wedding anniversary! These days they are kind of cute, still arguing and bantering with each other as they have throughout their entire married life. They also still have some pretty hard times, but mostly shrug things off and seem to consider the source. I guess that’s love. I used to teach Behavioral Medicine at a Medical College of Wisconsin family practice residency. That’s a fancy way of saying my job was to teach doctors how to talk to their patents. And how to listen. Each clinic exam room had a camera. Every quarter, I’d tape each resident doctor. After sorting through the tapes looking for the good the bad and the ugly, we’d meet to discuss their performance. The sessions for viewing tapes were, at times, tense. These high performing doctors grew wary when entering this unknown territory, far from the black and white certainty of lab results and x-rays. After all, where do you find more variables than in face-to-face communication? Some learned a few things and others were just glad that this “not real medicine” thing was over with. The tenor of medical school training seems to be fear. Will I find the right answer? Will I make the grade with my attending? Will I make a mistake and look dumb? Always going for the cure has its downside. But these are the things that drive their lives and prepare them for the real world. Empathic communication barely makes the list. The first thing to realize in this communication conundrum. is that medical schools recruit scientists. Left brain, analytical thinkers. The crème de la crème of college graduates. After four years of rigorous medical school training, they choose a specialty and enter residencies of varying length. Then they can take their boards and are ready for private practice. Family medicine is the only specialty that actually teaches behavioral medicine. So, surgeons, oncologists, pediatricians and all the others pick up their communication skills on the run. I began to think it’s a dirty trick to address effective communication when a doctor is so far along in their training. But that doesn’t diminish the importance of this issue. And we’ve all heard of the age old problem of poor communication between doctors and their patients. Personally, I think bed side manner is highly over rated. All you have to do is go through one life-altering or life-threatening medical experience and it’s easy. A doctor who knows his medicine is the one you want in the room with you. Not someone who tells a good joke or is able to relate to your problems with thirteen year old Billy. Whether the metaphor depicts different cultures or far away planets, the distance between doctors and patients is formidable. So what can be done? I think people who want their health care needs met need to understand who they’re talking to and learn to communicate effectively with them. Some patients may think it’s unfair that they have to do most of the work. But if you think you can, by all mean, begin a grass roots effort to change medical schools. And let me know how that’s working out for you. In the meantime, next week you have a doctor’s appointment. Here’s my advice. Don’t sit passively. Bring information. Ask questions. It’s okay to disagree. If you don’t understand, say so. Ask for an explanation in more common or non-technical language. What about a second opinion? Don’t be intimidated by the presence of a computer. That’s the future. Actually, that’s the present. Since January, 2014 it’s a federal mandate that medical records be electronic. Don’t be put off by poor eye contact. That might just be the doctor’s personality. Through this experience, I probably learned more than the residents did. I’m not sure empathy can be taught but I gave it my best with mixed results. And I did get some thank you’s. I do know that doctors are human and want to do a good job. I have little patience with people’s complaints that their relationship with their doctor is poor. I say get involved. You’re ultimately responsible for our own health care. Originally published in Creative Wisconsin, June, 2012. First place winner in Bo Carter Memorial Contest, essay category, April, 2014. Scene 1: I’m at book group, holding the book under discussion on my lap, open, fanning the pages. “This book is a hundred pages too long.” I’ve said this too many times lately, when I no longer care what happens to the characters. Or when conflicts and characters appear and disappear with no resolution. Or when the story’s either going nowhere or going in too many directions at once. Scene 2: I’m at writing group, listening to fellow writers as they struggle, trying to figure out how long their book will be/should be. Steve is incredulous at an agent’s suggestion that he add 20,000 words so his book would be more marketable. The Science Fiction and Fantasy Writers of America’s website has the most definitive answer regarding length: Novellas are between 17,500 and 40,000 words. Novels are 40,000 words and more. But other internet sites say a novel is over 90,000 words and below that is a novella. Another says anything shorter than 60,000 words is going to be hard to publish, and 70,000 or 80,000 words would be easier to sell. I’ve read similar comments in book review columns on the length of a short story and the special properties of the short short story. No one seems to know anything for sure. Even today, the influence of Raymond Carver, who was writing short stories and novels in the 1980’s and ‘90’s is still noted; he was considered a minimalist. So, I ran to the library and checked out his short story collection, What We Talk About When We Talk About Love, originally published in 1981. This tiny book of 159 pages contains 17 stories. The shortest is four pages long. I didn’t count the words. I’m not that curious. But that short of a story seems well below what, according to some, constitutes a short story. If four pages is not a story, then just what is this interesting piece of writing? The 294 pages of Alice Munro’s Open Secrets contains eight stories; the longest is fifty pages. Carver can write short and Munro can write long. They both write wonderful stories. And that’s what’s important. The concentration on word count and number of pages seems odd. How does a writer know when they begin, just what it will take to tell a story? What is a story anyway? I know, it has a beginning, a middle and an end, and who knows what it will take to get the whole thing down on paper. Scene 3: I’m sitting in my most comfortable reading chair, hugging the book I’ve just finished, yet another John Irving novel. His books, critically acclaimed for their sheer readability leave me totally satisfied. This one’s 827 pages seem just enough. Isn’t a story finished when everything is said that needs to be said? Isn’t it more important that the story is moving, characters are well developed, plot lines are clear, and everything is wrapped up nicely at the end? And that is John Irving. I think of Hemingway’s The Old Man and the Sea as a great story that can’t get much shorter. And whether this qualifies as a novel, a novella or a long short story, it is, first and foremost, a compelling piece of literature. Fitzgerald’s The Great Gatsby is an absorbing story where every word counts. Or as editors say: every word advances the story. so what prompts my “this book is too long” conundrum? Are authors, these days, adding some fill-in chapters or a few peripheral characters to please an editor instead of telling a tightly knit story with punch? My praise for John Irving may quell your thoughts that I’m a casual or lazy reader. Clearly, for me it’s quality, not quantity. At the other end, John Irving is known for doing research for up to ten years before he finally sits down to write. By then, he knows just what it will take to completely describe the pathos of Dr. Larch or to fully develop the likeable but quirky boy/man, Owen Meany. How tragic if any of these writers had added or deleted something, anything to meet the demands of the market or an overzealous editor. I think the best advice is to write until the story is told. This essay that I’m writing is 816 words long. I’m stopping now because I’ve said all I have to say.